Sir Arthur Conan Doyle, Silver Blaze. 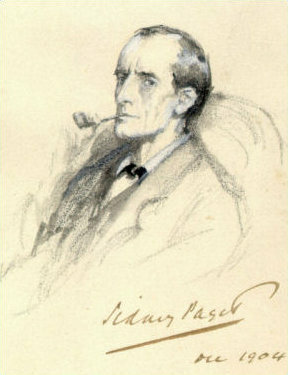 Sherlock Holmes - Wiki - Creative Commons. Why did Rev. Richard Jackson (1602-1681), who sired at least 21 children by his three consecutive wives, not name one of his sons Richard? After all, the family did have a tradition of naming children after parents, and ancestors. One of his daughters was named after his wife, and at least one of his grandsons was named Richard. The answer probably lies in the fact that only 17 of his known children have so far been identified, so there are clearly 4 more to be found. My hunch is that one of them was a Richard. Recently, the Beetham Funeral Entries came to my attention. This document was drawn up just after the death of Rev. Richard Jackson’s son William, and it mentioned a Nathaniel Jackson, a brother of William’s still alive in 1688 at the time of William’s death. Nathaniel’s place in the family is corroborated by notes from the 1705 will of another brother, Samuel Jackson, who includes mention of my dead brother Nathaniel of Leeds in Yorkshire. In these notes, recorded by Arthur Tenison Groves, Nathaniel has a son, although the wording of Groves’ notes is a little ambiguous on this score. Obviously, even though no Richard was mentioned in this 1688 document, it does not mean that he didn’t exist. It may mean that he had died before 1688, or perhaps had been disinherited. Two other known brothers, Thomas and Francis, are also not mentioned in this document. We know from the Biographical Register of Christ’s College that Francis was recorded as dead in his father’s 1682 will (which I have not seen). About Thomas, we have no idea so far, but let’s assume that he had died before 1688. That would fit. If there is indeed a missing son named Richard, it is then quite likely that he joined his brothers William and Samuel in the north of Ireland (or else, they joined him). One man worth looking at in this regard is the Richard Jackson (1626-1678) who headed up one of the significant Quaker Jackson families in Ireland. He started in the north, and found his way south, as did several other men in the family. Conveniently for this line of thinking, he died two years before this 1688 document where he is not mentioned. What else do we know? There is proof that in 1645, Rev. Richard Jackson already had 14 living children. The birth of his son, Rodger Jackson, was imminent, and yet Rodger is only the 11th child that I have found a record for, and that includes the three more that were added from the Beetham Funeral Entries. First one Mr. Jackson ministr of Whittingham neare Kyrby Lonsdall, a vry pious & honest able man haveing heretofore entred bond as surety wth a popish recusant (I psume it was wth hopes to gayne him to or Church) principall for the sume of 100li, this was donne before these troubles, & the popish gentleman proveing a Delinquent all his lands & meanes beinge sequestred, is utterly disabled to satisfy that debt, whereuppon honest Mr. Jackson is like to beare the burden, but I feare it will breake his backe & the creditours (now tyme begineing to be open (?) in Lancashire where Mr. Jackson lives that suites may be tryed) doth labour to pursue Mr. Jackson & recovr his 100li of him wch indeed is easyly done for the bond is cleere. Yet if lawe pceede agaynst Mr. Jackson & compell him to pay it as it will do, he will be undone, and not able to subsist haveing wife & many children, 14 children he hath & the 15th (is by this tyme borne for every houre his wife lookes for it) this is this honest ministrs desire & I earnestly desire the same, that yor Lorp be pleased to advise his friend (that will repaire to yor Lorp) what course may be taken that Mr. Jackson may have satisfaction, if any be to be had out of the delinquents estate of lands or woods, or any way whereby himselfe & the publike be not priudiced, we leave it to yor Lorps wisdome, & information of any that shall be imployed to come to yor Lorp. I am sure if yor Lorp can help him you shall not neede repent of it he is so honest a ministr. There were still 5 more children who came after Rodger, which leaves us still short four names, but at least, thanks to the Beetham Funeral Entries, we have found Nathaniel, alive in 1688, but dead by 1705, and a known brother to the Jacksons of Coleraine. Hopefully, we will soon learn more. Nathaniel is a tantalizing name for Jackson researchers in Ireland. It shows up less frequently in the early settlements than names such as William, John, Thomas, or Richard, and is therefore easier to track. Another reason for suspecting that the Quaker Richard Jackson is connected to this family is that he had a grandson named Nathaniel. The property transactions of this Richard’s descendents, the Jacksons of Mountmellick in Queens Co., include several Nathanial Jacksons, and the family naming patterns also echo many of the other names in Rev. Richard Jackson’s line. Mind you, with 21 children, the old reverend did use up a lot of names. No wonder his last known child was named Vigesima. It means twentieth, so I assume that her father did not count the infant Maria who did not make it to her first birthday. If the Quaker Richard Jackson (1626-1678) turns out to be a son of the Rev. Richard Jackson (1602-1681), then he would have been 19 years old at the time of his father’s financial distress, and a likely candidate to serve with Cromwell. His step-mother, the mother of baby Rodger likely died in childbirth, since Rev. Richard married his 3rd wife a year later. If my speculation is valid – and it will take more work to nail it down – it upsets many earlier assumptions. The received wisdom amongst many when it comes to the history of the Quaker Jacksons is that two brothers Richard and Anthony Jackson left England and settled first at Carrickfergus in Antrim. Some sources are unsure whether Anthony and Richard were in fact brothers, so we can set that aside for now. It was in Ireland that this Richard met and married Margaret Keete. His birth date was found in the minutes of the Quaker Mountmellick Meeting, but his father was not named. It seems clear that this Quaker Richard was a soldier in the Parliamentary army in 1649 and was amongst the first of the Quakers to settle in Lurgen, Co. Armagh and then later in Co. Cavan and elsewhere. He then uprooted to Mountmellick, where his son Robert, grandson Nathaniel, and great-grandson Nathaniel, as well as numerous other descendents continued to reside. These are some of the known facts. I am not alone in questioning the supposed ancestry of these early Quaker Jacksons, which has them descending from Sir Anthony JACKSON (1599-1666) of Killingwold Grove. That link was debunked by Sir Edmund T. Bewley as early as 1903: The Ancestor; a quarterly review of county and family history, heraldry and antiquities No. 7, 1903. pp. 66-71. Not only is there an entire absence of any evidence of a descent of this Anthony Jackson from the Jacksons of Killingwoldgraves, but there is a strong presumption against any such descent. It will be found, I think, that the first suggestion of this descent came from ' George Henry de Strabolgi Plantagenet ' Harrison or whatever his proper designation may be whose unscrupulous conduct in pedigree mongering is dealt with by Mr. Walter Rye in his Records and Record Search in Portions of the Greer pedigree as given in the early editions of Burke's Landed Gentry were severely handled by 'Anglo-Scotus ' in the Herald and Genealogist (vi. 137) ; and I think the alleged descent from the Killingwoldgraves Jacksons is almost worthy of a place in the Ancestor under the heading of ' What is Believed. Bewley (1837-1908), whose family were Quakers from Cumbria, was not some crank who can be readily dismissed. He was a much-published researcher, who was well respected in Ireland, England and America. Over and above what he mentioned, there is one more clue that makes me side with his suspicions. According to the Memoir of Halliday Jackson, Thomas GREER of London, one of the descendants of the Jackson family, discovered the genealogy of the family extending back four generations beyond the published record, as well as the coat of arms confirmed to Richard Jackson in 1613 in the British Museum. I do not know what he discovered with respect to the four generations of Jacksons, but I do know about the Coat of Arms awarded posthumously to Richard Jackson (1560-1610), husband of Ursula HILDEGARD, son of Anthony (1540-1560) and a grandson of Richard (1505-1555). This crest contained the elements of three golden suns. I have never seen a Jackson crest with three suns being associated with any of the Jacksons in Ireland. The crest that does show up in association with them – repeatedly - is a crest that features three birds, not three suns. Sometimes, these birds are cormorants, sometimes eagles, sometimes ducks. You can see many of them on an earlier post on my website: Jackson Crests. In understanding the history of the Jacksons, it also helps to follow where people like them were likely to start from and then move to. The recent posts by Dublin’s Trinity College about the Down Survey of Ireland include maps of the Cromwellian Conquest. They are a great help. One map, from 1649, shows which parts of Ireland were and were not under British control. It is clear that the lands in Co. Cavan, where some Jacksons had been “planted” in the early 1600s, were beyond the pale. Otherwise, the pre-Cromwellian Jacksons primarily resided and conducted business in the Protestant strongholds of Londonderry, Drogheda, Dublin and Co. Cork. The post- Cromwellian lands, where Jacksons took up leases in the mid-1600s and afterwards, were primarily reserved for Adventurers and Army. In short, these Jacksons were either leasing from the supporters of Cromwell, or were owners because of their support of Cromwell. Scientists and detectives use the word hunches rather than guesses but it amounts to the same thing. Everything in this post is a guess, but it is part of the necessary imagining that helps us to move past brick walls. No matter whether time proves me right or wrong, I promise to keep you posted. In the near future, I will also be posting more data that may help us to suss out where we should look next. The documentation that I have posted on my web site which has lead me to this hypothesis includes dozens of documents - too numerous to mention. There will also be many more to come. One place to start is by looking on my page: What’s NEW. There are two researchers who shared key documents that were key to me being able to form this hypothesis: Jan Waugh and Iain MacRae. My profound gratitude to them, as well as to all the other researchers on whose shoulders I stand on as I peer into the murky past. oops,should say I need Daniel Jacksons parents and back..same for Lucindas ancestors ! To my knowledge, I (personally) am the latest Richard Jackson (born March 1948 in Wheeling, WV, USA) from this family ancestor. Hello, I have been doing research on my family history going on 10 years and found that I descend from royalty, Please authenticate my findings if possible, Thanks! Daughter of Oscar Odell Jackson Sr.